Coneflower Hill Prairie gets its name from the spectacular display of pale purple and purple coneflowers that occur in July. 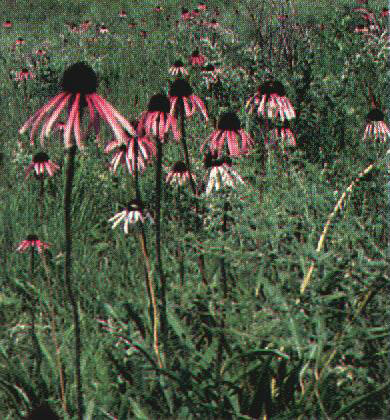 The presence of both species of this coneflower on the same prairie is unusual. Fifty-nine species of plants have been recorded from this 4 acre prairie. In addition to the coneflowers, other species present that are indicative of good quality prairie include false dragonhead, purple priarie clover, and prairie dropseed. In 1990, a rare butterfly, the Ottoe skipper, was discovered at this hill prairie. This butterfly is known from less than 10 sites in the state and is listed as a Threatened Species in Illinois. The adults feed on the abundant coneflowers. The continued management of the prairie vegetation at Coneflower should insure the continued existence of this rare butterfly as well as the prairie itself. Coneflower Hill Prairie is included in the Illinois Natural Areas Inventory - a list of high quality natural areas of statewide significance. It is the only known hill prairie on the Kaskaskia river north of Shelbyville and the best quality hill prairie along the entire length of this river. It is an important part of Illinois' natural heritage. What is a Hill Prairie? A hill prairie is a prairie opening on a forested slope, caused by a combination of factors which result in droughty, well-drained soils. Hill prairies typically occur on steep, exposed, south and west facing bluffs. Periodic fires have maintained many hill prairies. Some hill prairies occur on eroded glacial drift, especially where a river valley cuts through an end moraine, exposing the coarse glacial deposits in the moraine. Coneflower Hill Prairie is a glacial drift hill prairie as it is located on a southwest facing bluff of the Cerro Gordo glacial moraine overlooking the Kaskaskia River Valley. 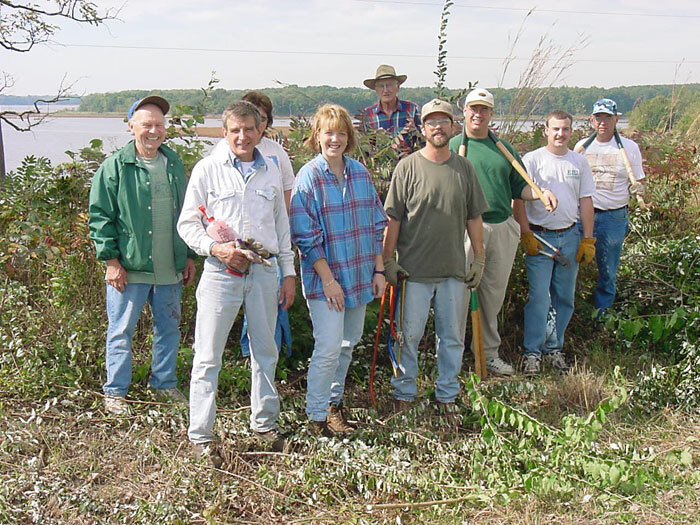 In the 1970's natural heritage biologists from the Illinois Department of Conservation recorded numerous prairie plants on an exposed bluff along the Kaskaskia arm of Lake Shelbyville. In the absence of fire, many shrubs and trees were invading the site, shading out and crowding out the prairie plants. Recognizing this as a remnant hill prairie, the DOC implemented, with Corps of Engineers approval, a management plan which included removal of invading shrubs and the reintroduction of fire. The hill prairie has responded well to this management. Larry Thorsen and Barry Haist work to combat the evil autumn olive. Seed collection time again! 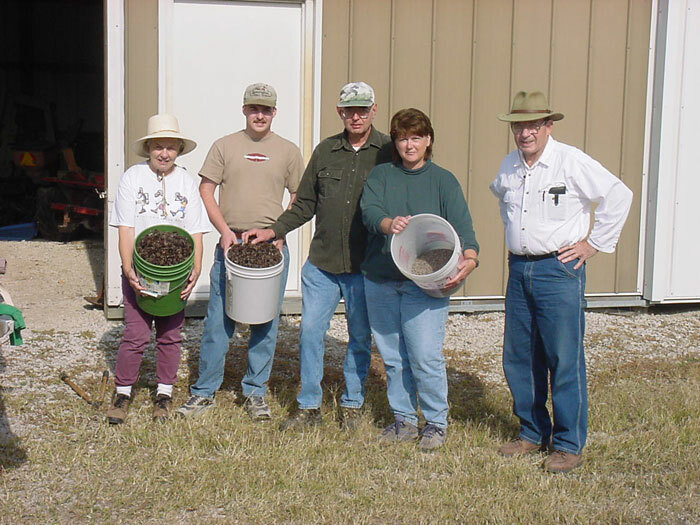 With the seed we collect, additional areas around Coneflower will be planted and restored to native prairie. From left to right are: Beverly Foote, Nick Owens, Barry Haist, Dee Carlock, and last but not least Dan Foote. 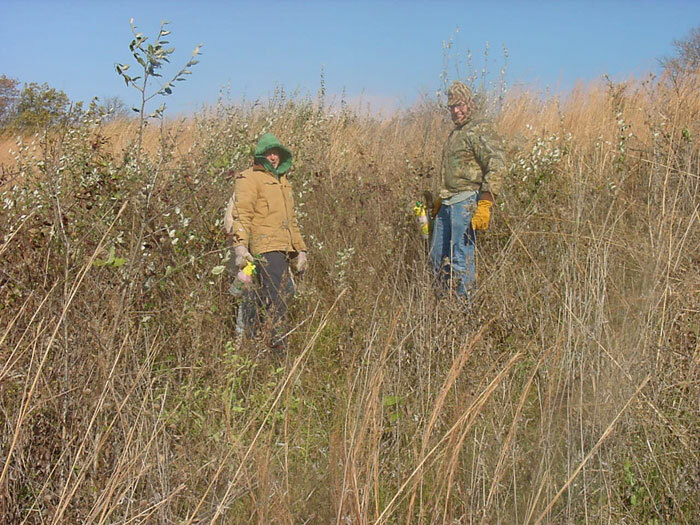 Yet another workday at Coneflower Hill Prairie, battling exotic species such as autumn olive and bush honeysuckle, two of our worst enemies! Pictured here from left to right are: John Speer, Larry Thorsen, Dee Carlock, Angela Smith, John Jansen, Dave Fopay, Nick Owens, and Barry Haist.